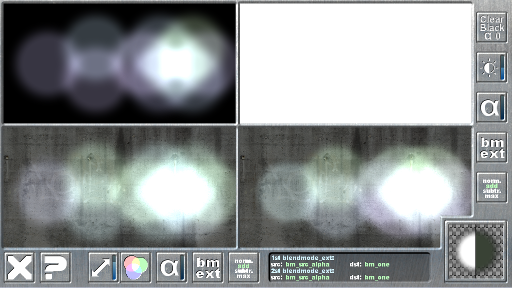 A Tool to test different extended blend-modes and thus hopefully start to understand how they work. A tool that explains how premultiplying alpha into a sprite and shape color works and how that can be used to draw on a surface and to make masks for surfaces similar to masks in drawing programs. A Gimp Script-Fu script to premultiply alpha into an image. Tested the no-install-version on two systems and both anti-virus-scanners rang alarm. One even automatically removed it and I had to manually get it out of quarantine. The Program has a fixed resolution width of 1024px. So on most mobiles everything will be a bit small. On a 5" display it's just so useable with a pen. On Tablets it's much easier to use. For that purpose you can choose a sprite to be blended, set it‘s attributes like size, color and alpha and set the blend mode. with a solid white background and to the lower left quadrant with a solid concrete photo-background. concrete photo-background as well. You can choose the clearing type of that surface and how it is blended with the background. those bugs or add another feature. I learned from this what I needed to learn and that‘s that. I hope no one minds. Nov 30th 2014: Added another little tool I made to learnmore about premultiplying alpha into a sprite or color and like this drawing on a surface and then masking the surface. The whole idea is comparing different methods of drawing on a surface by setting up a reference and then different examples on other methods. There's an explanation to each example when hitting the i-buttons at the bottom of each example and I'll also include the .gmz in case you want to read the code. I tried to clean it up a bit after I was finished, but it's not really optimized. Though I guess it's still easy enough to read with the comments I added. Added Fonts to the test to show different way to premultiply their alpha. 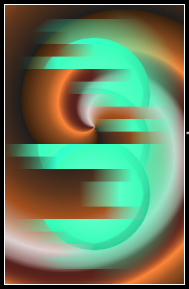 This script copies the active layer and premultiplies the alpha values into the colors of the copied layer. 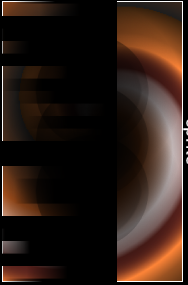 The original layer is kept but will be set invisible. This can be used to easily premultiply the alpha values into the colors of an image. You can do the same to any sprite ressource within GMS as well (not sure from what version on though). Open the sprite properties and then the editor. Just beneath the menu there's a tool bar and the the right most icon is 'Pre-Multiply Alpha'. There's one important thing to know though: Usually you'll create your sprites in an external program like GIMP. Depending on how you create and save the file premultiplying in GMS could lead to very bright borders. I don't yet know when that happens, but guess it's something about how the fully transparent pixels were saved. Edited by The Reverend, 31 May 2015 - 06:03 PM. VERY nice little tool... And the minor bugs don't affect it's value at all. Thanks for Sharing! However, I'm moving the topic to the appropriate forum, as it's not a Technical Issue, but a tool... Oh, and I've pinned it too! this really is something that people should be aware of. Disabled the thingy and downloaded again, and it's working perfectly fine. I would much appreciate a version that doesn't require an installation, especially as GM:S easily allows it. Added a link to a no-install version. Thank you very much! This tool is very handy. Edited by dark_master4, 31 August 2014 - 11:21 PM. Hope it'll help some people understand more about surfaces and premultiplication of alpha values. A big thank you for the masking examples in tool #2! I've been studying blend modes and alpha masks the past few days (eg. the brilliant blend mode example by Phantom107), however I'm a bit stuck. I'm currently figuring out how to use an image with transparency as the alpha mask for another image that also has transparency. Specifically...an animated alpha mask that I'm generating with code and a couple of images on a surface. My end goal is to have a sort of "materializing" effect when a monster spawns in a platformer game. The most crucial part of the experiment is that my main target platform is HTML5. I realized that the premultiplied alpha mask method should do the trick, but I've ran into a bit of an issue that has led me to believe that using alpha masks and premultiplied alpha is currently broken in GameMaker Studio, when exporting to HTML5. However, when I run it in HTML5 it fails (using the latest stable version of both Chrome and GameMaker Studio). At this stage, I'm kinda lost. 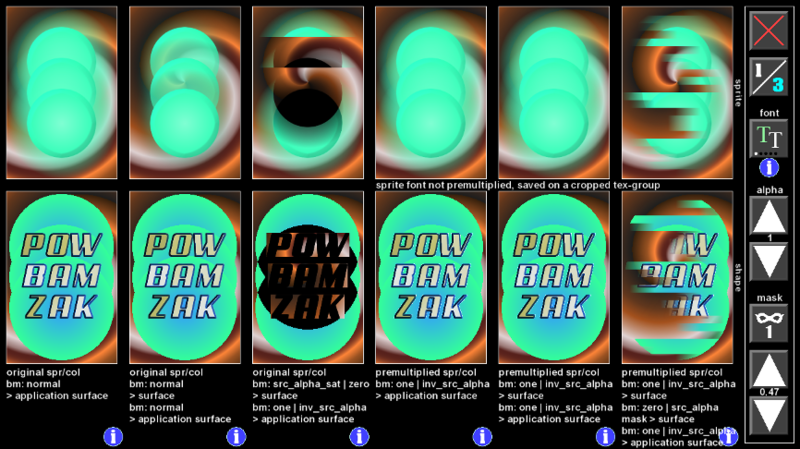 I've tried pretty much all of the alpha mask examples I could find on the forum (including examples for blend modes, surfaces, etc, some dating back to 2009). Everything works brilliantly when I export to Windows, but when trying HTML5 on both Chrome and Firefox, with WebGL either enabled or disabled, the only luck I've had is with blend mode examples. Premultiplied alpha masks on surfaces aren't playing nice. Do you think this is a bug that I should report to the staff? I've noticed this is a staff pick and it's pinned in the learning section, so maybe a staff member could pop in and help me out a bit. Am I heading down a dark and scary road by trying this in HTML5? I feel like doing it on surfaces is correct, but I'm unsure whether this is something that a shader should be used for, or if the task can be solved entirely with GML. If anyone has a clue how to get this premultiplied alpha mask example working in HTML5, I'm all ears! Edited by ryanmc.nz, 19 April 2015 - 08:10 AM. I'm sorry I didn't reply earlier. I didn't see this message until yesterday. Unfotunately I do not have the HTML Module and thus cannot test it. It has two sprites: original and premultiplied. First it shows the original sprite. When hitting space it shows the premultiplied sprite. Next the premultiplied sprite gets drawn on a surface and the surface to the application surface. and lastly I tested what happens if I draw the sprite on a surface, create a new sprite from that surface and then draw that new sprite to the application surface. If everything's working as it should, the screen should look the same in every mode. Then you could add some masking and see if it's still working. There's not more to that program than that. So I guess if it's not working in HTML then we're either missing something or the export module does have a bug. Feel free to use that gmz if you contact support. And if you do find a solution, please post it here so others can read about it. so that part should not be the Problem. Edited by The Reverend, 31 May 2015 - 05:54 PM. Cheers for the follow up The Reverend, and especially for the new example project. This has helped get an idea of what I need to isolate out when targeting HTML5. I've ran that example and it was successful on Windows as well as HTML5 (with both WebGL enabled and disabled), and the appearance was correct across all tests. So it sounds like perhaps the problem on HTML5 only occurs when actual masking is added to the technique. I'll chuck in some masking with this new gmz and see if I can replicate the same problem with it in Chrome and Firefox. I haven't heard from staff yet, so whatever the outcome is I'll post it on here and let them know if it doesn't work, just in case it definitely is a bug. After some further testing with that recent additional example, I managed to get masking working correctly with blend modes in HTML5 (with WebGL enabled). At this stage my only clue on what caused the original example to fail loading entirely in HTML5, is the absence of the GML script for converting an existing sprite resource into a pre-multiplied sprite. That's the only real difference I could think of. The masking itself seems to work fine when isolated away from dealing with converting existing resources to be pre-multiplied. Thanks again for the help, I really appreciate it. Edited by ryanmc.nz, 09 May 2015 - 09:13 AM.